In our next part of this blog series we are going to talk about proactive monitoring and maintenance tasks. In many cases actions are taken when the environment already has an issue and end-users are suffering from an outage. 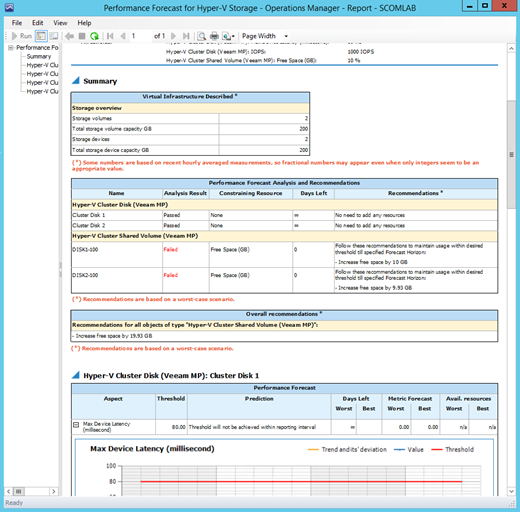 However, System Center Operations Manager and more specifically our Management Pack is written around pro-active monitoring. Instead of the traditional fire-fighting that happens in many environments, you can use the different MPs and their views and reports to monitor pro-actively and solve issues before they actually happen. Proactive monitoring can be as easy as repeating certain tasks on a daily, weekly or monthly basis. No, it won’t protect you from sudden drops in performance or sudden crashes, but if you perform this well, you will manage to solve quite some incidents before they actually happen. In the Veeam MP there is a view called Top Hosts. 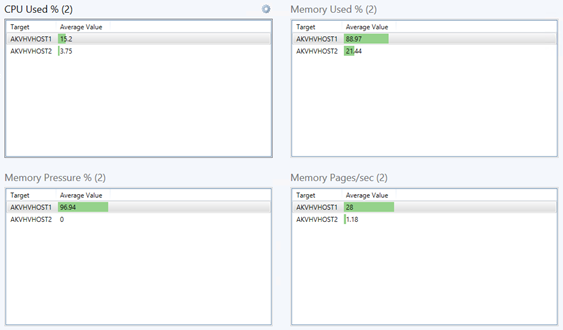 This view can be used to see quickly what you hosts are doing on 4 important performance counters. As you can see, at this moment everything is green (good) but when there would be another color like yellow or red, you would be able to drill-through and search for potential upcoming problems. It didn’t took me long to figure out what really happened. The monitor for hard drives (in the base OS management pack) had a warning and critical state. Because during the day everybody was busy fixing the critical issues, nobody watched the warning ones. This meant that when the free space dropped from warning to critical, the notification came (mostly at night because of certain processes that ran at that time). Some dashboards can be looked at daily, others you might look at weekly or even monthly. But besides dashboards or views you can also work with reporting. In SCOM you can work with historical data (default a year worth of data) and perform trend analysis, capacity planning and forecasting. Some management packs have that type of reporting out of the box, for other management packs you will need to build them yourself. This report (for example) can be reviewed every Friday to view what our storage on our virtualization platforms is doing. This should give us insight whether we are suffering on IOPS, latency, free space or others way before it will actually downgrades the environment. By simply using the standard views and quickly reviewing them on a daily, weekly or monthly basis you can avoid problems before they actually “cause” problems.